Years ago, I promised my husband Rick that we would celebrate his 70th birthday by taking the Trans-Siberian railroad. When I made that promise, seventy seemed so far away. As the time drew closer, I realized that was a promise I just could not keep. There are only two ways to do the Trans-Siberian railway: the regular Russian train, which is hard traveling, or the high-end tours such as the Golden Eagle express at 25K a person. The latter was definitely out of the question, and given our experiences with Russian trains, we didn’t want to risk the former. I convinced Rick that the mosquito infestation in the Siberian summer would be intolerable and he agreed that maybe taking the Trans-Siberian wasn’t such a great idea after all. I asked Rick if he could think of any other place he’d like to see that weren’t on my list, so it really would be a birthday gift for him. He said Poland and Berlin. Rick has always had a strong interest in the languages and history of Eastern Europe. His father and all of his grandparents were born in Eastern Europe and he began his academic life as a Slavic Studies major. I’ve always been drawn to Latin Europe and probably never would have gone to Eastern Europe if it hadn’t been for Rick. We went to Czechoslovakia and Hungary in the summer of 1989, right before the fall of the Berlin Wall, to Russia and Estonia in 1990 and gain in 2003. We never managed to fit in Poland and this seemed the right time—definitely a gift for Rick. 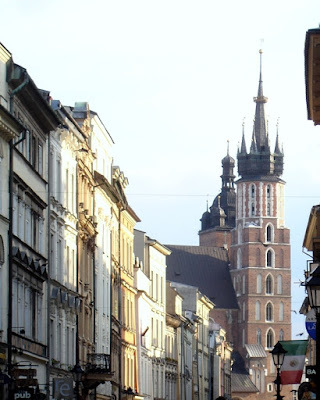 Krakow is an open-air architectural museum with one of the most beautiful old town squares in Europe—-right up there with San Marco in Venice, St. Peter’s in Rome, the Plaza Mayor in Madrid, Old Town Square in Prague. 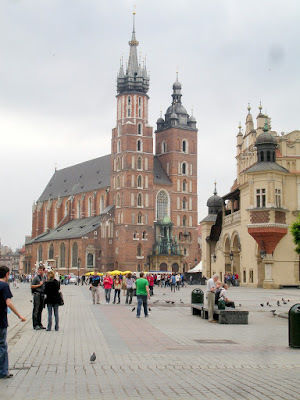 We spent a lot of time hanging out in the cafes around Krakow’s Rynek Glowny. Krakow’s restaurants were a pleasant surprise. When we traveled in Eastern Europe in 1989, we couldn’t find anything other than horribly heavy food—-the same meat and potato dishes appeared in every restaurant, and salads were unheard of. The culinary landscape in Eastern Europe has changed. Our first night in Krakow we went to a wonderful little restaurant which specialized in Polish (and--surprise-- Italian!) dishes. This combination appears to be a popular one in Krakow, with several very good restaurants specializing in it. It worked out very well for Rick and me. For Rick, Polish cooking is comfort food, grandma’s cooking, but at some of these restaurants, comfort food at a very high level. So Rick could have a herring appetizer and a sauerkraut and sausage main dish and I could have an arugala salad and a pasta dish. Miod Malina: One of the best of those Polish/ Italian combinations that worked for Rick and me. Aqua e Vino: Aqua e Vino: Not just one or two Italian options on the menu, but a real Italian restaurant. Our major dailies, the Inquirer and Daily News have generally ignored the internal workings of Democratic Party—a real problem given this is a one Party town and it’s difficult for candidates (especially in low profile or judicial races) to be elected without some Party support. Many thanks to City Paper for covering this. Municipal elections tend to get progressives focused on reforming the local Democratic Party. The last municipal elections cycle there was some talk of changing the Philadelphia Democratic Party, but after the election, it petered out. This time rates to be different. Our focus so far has not been on individual candidates but rather on the way the Party operates. The Philadelphia Democratic Progressive Caucus was formed in response to the party’s failure to seat Tracey Gordon, a duly elected committeeperson. “Ann Brown, a high-level staff member within the local Democratic Party, argues that committee people have to take orders at times: "If we don’t stick together," she says, "we can’t run a party." We may finally have a critical mass of progressives who are serious about reform. More and more progressive candidates and their supporters have seen the way the Party operates up close and personal. And they don’t like what they see. The closed structure of many wards has made it difficult for strong progressive candidates to win citywide. In this primary season, we have seen that in wards that are democratically run, wards where committee people actually VOTE on endorsements, progressive candidates like Sherrie Cohen and Andy Toy have a chance of being endorsed. In addition to support for Tracey Gordon, after considerable discussion and many revisions, the PDPC adopted “The Open Ward Statement of Principles”based on a document by second ward committeeperson Mitch Goldin. Although the PDPC has not yet disseminated this document officially, some progressive caucus members have made good use of it. Pennsylvanians for Reform has posted it on their website and one committeeperson reported sharing it with committeepeople in his not-so-democratic ward to let them know that another ward model is possible. By supporting Tracey and bringing her case to the attention of State Committee, by starting a conversation among progressive committeepeople around the city, by developing a model of what a democratic, transparent ward should look like, the PDPC has made some progress. Having the caucus in place, having a network ready to respond when something like the Tracey Gordon incident occurs is valuable in and of itself. Interest in this project will no doubt be much greater as we approach 2014 when we will once again elect new committeepeople. There will be generational change in the Phila. Democratic Party. Will the new leaders be mostly the children and grand children of the old guard or will they include a new generation of young progressives? It certainly should be easier to encourage more young progressives to get involved in grassroots politics and run for committeeperson if they know there is an organized group trying to change the culture of the Party. If a democratic tide can sweep the Middle East, surely a movement for democracy in the Philadelphia Democratic Party is possible. Karen’s post titled “The Stars of My May Garden” led me, as her garden posts often do, to contemplate my own gardening experiences⎯as well as to admire hers. I have recently been struck with how the highs and lows in my garden follow in rapid succession, if not simultaneously. A high followed by a low: In preparation for the blooming of my many clematis this year, I moved some outliers. Years ago, before I knew that clematis were fussy, I just dug them up with only minimal care and moved them and they thrived. Now I continue the process, ignoring all the advice about how careful one needs to be, and it works. This spring I moved three plants that were five feet tall and a number of other smaller ones that were growing where they didn’t really belong—among the raspberry bushes or lolling on the ground without support. They all did well and bloomed, but for some unexplained reason three other old clematis simply died⎯healthy one day and dead the next. A surprise: I read that clematis look pretty twining in a rose bush. I couldn’t quite imagine it so never tried, but the clematis and the wild rose took matters into their own hands. I’m very pleased with the effect. Another surprise: In my little front yard and with a quick glance, I thought the lilacs were really spreading and had produced white ones as well as purple. On closer investigation I realized that the white blooms were not lilacs at all. I sent a picture to Karen, who said they looked like apple blossoms, but the landscaper who came by said the plant looked like a pear tree. How did I get a pear tree? And, more important, what will I do with it? It’s very pretty and so far is not interfering with the lilacs⎯they seem quite happy together. I think I’ll wait to see if I get edible fruit before deciding whether or not it should come down. And that way I’ll at least know from the fruit what it is that I have.